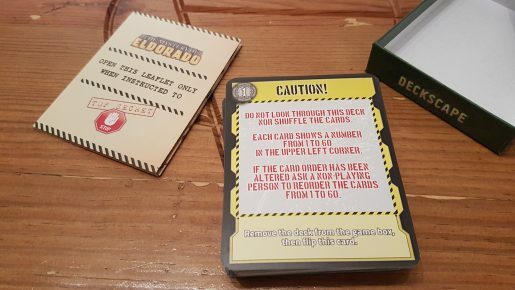 Deckscape The Mystery of Eldorado is a cooperative escape room styled board game that is hot of the press. Published by dV Giochi and designed by Martino Chiacchiera and Silvano Sorrentino, this is the fourth Deckscape title. Taking about an hour to complete the game sees 1 – 6 players flipping cards, solving puzzles and trying to discover the mystery of Eldorado. The main character was looking to give up on their search for Eldorado, should gamers too? Let’s find out! Coming without a rulebook, players are faced with a deck of 60 cards and a folded sheet of paper that they are instructed not to open until told otherwise. Like the rest of the series there is no app to download, though it is a good idea to have a phone nearby to keep time. 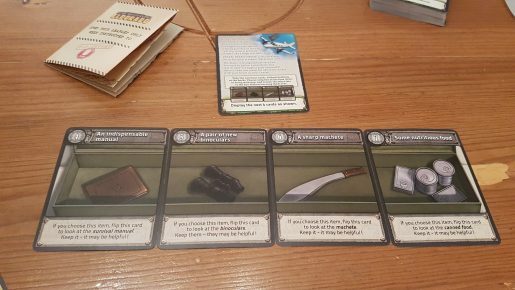 Players setup the escape room experience by simply turning the starting card over and following the instructions on the cards, learning how to play as they go. Before playing it is best to grab some paper and a pencil – this is mentioned on a card but no one likes keep getting up and down. It is important in this version to get a pencil not a pen, to allow you to rub things out. As with other escape room games if all the players sit next to each other it makes the experience somewhat easier, so everyone can read the cards the right way up, but this isn’t essential if not possible. In an effort not to spoil any of the experience the images used in the review show examples of choices but not how they would affect things. On top of this, the only storyline information mentioned can be found on the back of the box or within the the first introductory cards not the main experience. The way the game works is that the double sided cards feature a puzzle on one side and the solution on the other – so make sure not to peak! The introduction puzzle cards teach how the cards works, flipping and solution wise, and help you get into the right mindset for the game. At the end of these cards a scoresheet appears. This is where the true fun begins and players note down their starting time. In Deckscape The Mystery of Eldorado failing puzzles is handled somewhat differently to the previous adventure, Heist in Venice. There are two types of fail letters: Z’s which you can have two of and X’s which penalise you time at the end of the game. Often if you were to fail at working out the exact solution a Z is awarded, and when players have two already any additional Z’s are instead taken as X’s. This feels somewhat more forgiving than before but perhaps players will be more likely to fail a few times than in previous adventures. At different points during the adventure multiple paths become available, with players instructed to a split out the next few cards into separate coloured piles. While the colour doesn’t affect the types of puzzles, there is a variety throughout the adventure, it speeds up splitting out sections – saving valuable time. As with the rest of the Deckscape titles players encounter a lot of small puzzles, some linking together, rather than fewer huge puzzles. Puzzles come in the form of visual details on cards, using learnt information and even spatial puzzles, among other types. As a group the band of adventures must decided on a solution to a card in front of them before flipping it over. At this point the card is flipped over and the correct answer revealed. Right or wrong you continue the journey, so there isn’t the awkward waiting when unable to solve a puzzle or having to attempt it over and over again. At the end of the adventure players get to see how well they have done. Firstly, you note down the time you finished. Secondly for each X a penalty of time is added to how long it actually took you. There are score breakdowns to see if you are a great or… not so great explorer but this bit is just for fun, either way you’ve completed the adventure! Deckscape The Mystery of Eldorado has less of a team feel to it compared to the Heist of Venice. This is due to the players going through the deck together following a main character rather than there being unique characters for player to control. This was a great feature from Heist of Venice that helped it stand out from the rest of the genre and is unfortunate that it hasn’t been carried across. 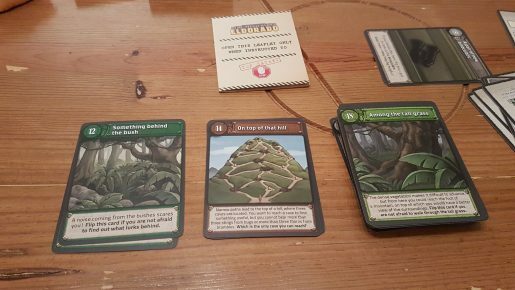 For solo gamers be aware that there is a single card in the deck that is effectively skipped if playing alone, something that wouldn’t sit right with me if I had played solo. As you only get one playthrough, even though it’s one card, I’d be a little annoyed to have missed out a tiny bit of the experience. A nice balance has been struck in terms of difficulty in The Mystery of Eldorado. You won’t be left scratching your head for minutes on end but a fair few cards will make you stop, think and even look through previous cards for thinks you’ve forgotten. The weight is perfect for playing on an evening after work, where other puzzle games might be a bit too taxing to be enjoyable. There are also a few interesting choices to be made that impact how future puzzles are handled. These are not game changing choices but give help depending on what equipment you have. The art that adorns the cards is great for building the setting, whilst making sure each puzzle is clear – at least when not intentionally concealing something. This removes the frustration which games like Unlock! have where players can get stuck staring at the cards in search for a hidden number. Clear objectives is not at the detriment of the game though, just meaning the puzzles will be different to solve. 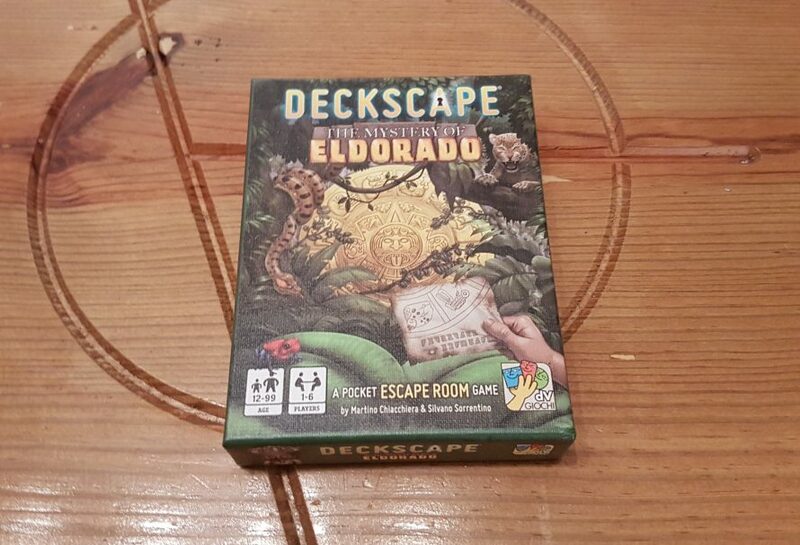 Deckscape The Mystery of Eldorado is the second title I’ve played from the series and in terms of a solid escape room experience the series is two for two. The way the puzzles link together generates a narrative and this is only strengthened by the illustrations. Difficulty wise this isn’t an experience which will make you hot under the collar, enough to make it feel like you’re literally in the jungle, so if you want a real challenge this might not be for you. Nevertheless for a fun hour of gameplay between a few friends, trying to crack some puzzles, Eldorado is certainly worth stumbling upon!